In the clearest signal to date that the developer tools stack is firming up, development workspace provider Codenvy and Linux leader Red Hat jointly announced Thursday morning their intent to absorb Codenvy’s 40-person team into Red Hat’s OpenShift. 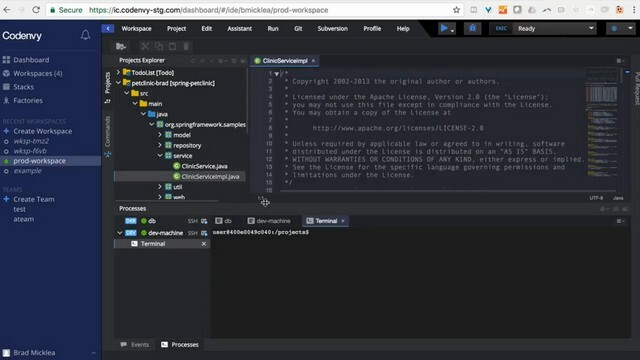 Now, the development environment Codenvy has called the “world’s first microservices IDE” will become an integral part of Red Hat’s OpenShift.io platform (announced earlier this month) as it approaches more of a competitive par against the giant in the development tools space, Microsoft. “The dirty secret of development teams today is that the team spends at least half of its time just managing its development infrastructure,” explained Codenvy CEO Tyler Jewell, in an interview with The New Stack. “Whether it’s a developer setting up his workspace on his laptop, or the integrations into version control, issue management, pipelines, continuous integration — you name it, the spectrum of tools which are mandatory in order to be part of a development workflow, has grown. And every development team needs that infrastructure. Jewell himself has been the architect of a sophisticated map of the container ecosystem — not the one proffered by the Cloud Native Computing Foundation, but a more complex breakdown of the various choices available to developers who seek to build containerized applications on modern platforms. That ecosystem map appeared at the time to place the very component on an even footing with one another, even Codenvy’s (although it does appear in the upper left corner), and it even placed Red Hat and OpenShift in a hard-to-locate box in the midst of all the other deployment platforms. Now, Jewell and Red Hat Senior Director for Development Programs Harry Mower — an eight-and-one-half-year veteran of Microsoft, before joining Red Hat in 2014 — are making the case for a simplified developer tools stack. Their argument is literally that the abundance of choice has made life difficult for developers, and life would be so much simpler if they could flip a switch and have everything be ready. It’s the type of development environment that several of the infrastructure specialists with whom we spoke at OpenStack Summit in Boston a few weeks ago, would be quite impressed. There’s significant demand within enterprises, including from people other than developers, for a software creation platform that’s consistent, predictable, and that does not present odd constraints upon infrastructure providers at inopportune times. Codenvy’s Jewell calls this the “fundamental problem of dev infrastructure.” He told us that, some months back, his company came to the collective conclusion that the only way anyone would resolve this problem would be “to take the totality of the dev infrastructure for each team.” Anyone seeking to be competitive in this space, he said, would either need to offer a complete developers’ tool stack end-to-end, or partner with someone else whose tools would be complementary for such a stack. It had not occurred to Jewell or his colleagues yet that Red Hat, or anyone else, might want to acquire Codenvy outright. So does Red Hat, now paired with Codenvy, now perceive the various components of the developer tools ecosystem “zipping up,” if you will, into more vertically integrated, pre-stacked stacks? “I think that this is an inevitable trend, and it’s the only trend,” responded Jewell. He cited last July’s news of Amazon Web Services’ acquisition of Cloud9, and the absorption of its IDE into its cloud-native development stack, as the starters’ pistol in the race to lock tool chains together and secure them to platforms. He noted that IBM, SAP, and Samsung are among the vendors that have adopted Eclipse Che — the open source developers’ workspace upon which Codenvy’s platform is based — effectively baking Che into their respective platforms. In so saying, Jewell seemed to indicate that Codenvy really didn’t have much longer to wait before the development platform space was all sewn up. Of course, the one platform vendor that didn’t need to acquire an IDE from a third party is Microsoft. Visual Studio still holds a commanding lead in many analysts’ estimates as the platform of choice among developers of all kinds. But among specialized developers — distributed container developers being one such group — Microsoft has not been able to leverage its general leadership into these emerging branches. So when we asked Harry Mower — a man who was once Microsoft’s chief developer evangelist — whether Codenvy will likely become Red Hat’s Visual Studio, he made sure we understood his answer quite clearly. Meanwhile, the soon-to-be-no-longer-CEO continued, the process of software development has become more standardized among institutions, and much of its ambiguity has been removed. An FAQ document posted Thursday by Red Hat indicated that Codenvy customers should continue to contact Codenvy for their support services, although it appeared to leave open the possibility for change. Mower told The New Stack that the consummation of Red Hat’s business deal should not take longer than a few weeks.